Beverly Cleary was born on the 12th of April 1916, she grew up on a farm in Yamhill, Ontario, a town so small it had no library. Her mother arranged to have books sent to Yamhill from the State Library and acted as librarian in a room above a bank. Beverly's love for reading started here. Some years later her school librarian suggested she should write books for children when she was older. This idea appealed to Beverly who decided she would write books for children, the kind of books she loved to read but could not find on the library shelves. Beverly has written more than 40 books for children and young adults and she has won numerous awards, both in the USA and internationally. Her books can be found in more than 20 countries and in 14 different languages. Perhaps her most well known books are about the adventures of Ramona Quimby, who has also appeared in a movie adaption in recent years. Currently we have one compendium book, The Best of Ramona, written by Beverly Cleary in the Fiction section of our library. 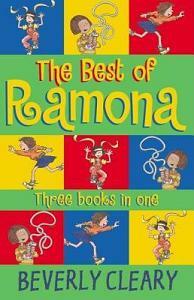 This book contains three books: Beezus and Ramona; Ramona the Pest and Ramona the Brave. Upper Hutt Library currently holds copies of about 10 children's books by Beverly Cleary, including one in digital format. The above information about Beverly Cleary was adapted from her website HERE. You can find out more about her and her books HERE too and also some fun stuff HERE.